Gas combination ovens combine microwave power with a gas powered traditional oven to achieve rapid, high quality cooking that applies heat to the outside and the inside of food simultaneously, ensuring quick results without compromising on crispness or texture. Gas combination ovens are generally more cost effective to run than electric combination ovens, though of course they require a gas connection to operate. Manufacturers such as Lincat, Eloma and Lainox provide a good range of choices in this category, including propane and natural gas options, and a variety of sizes from small counter top units to large free standing ovens. The gas Combimaster combination oven range from Lincat utilises the latest technology to deliver maximum cooking speed and power, the most flexible cooking options and super easy cleaning and maintenance. 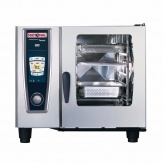 Choose from dry or moist heat cooking, general combination cooking, steaming and finishing, and be assured of perfect serving temperature by using the precise core temperature probe provided. 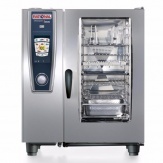 The programming function allows you to create and store up to 50 custom cook cycles, and the automatic cleaning and descaling programme makes short work of keeping your gas Combimaster in good order. 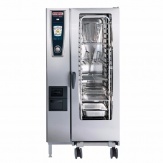 A range of sizes and capacities are available from small countertop units to large freestanding ovens. Two year parts and labour warranty is offered as standard.